In 10-inch skillet, melt butter over medium-high heat. Add rhubarb; cook about 5 minutes or until rhubarb is softened. Remove from heat. Stir in mixed berries, granulated sugar, flour, cinnamon and vanilla. On ungreased cookie sheet, unroll pie crust. 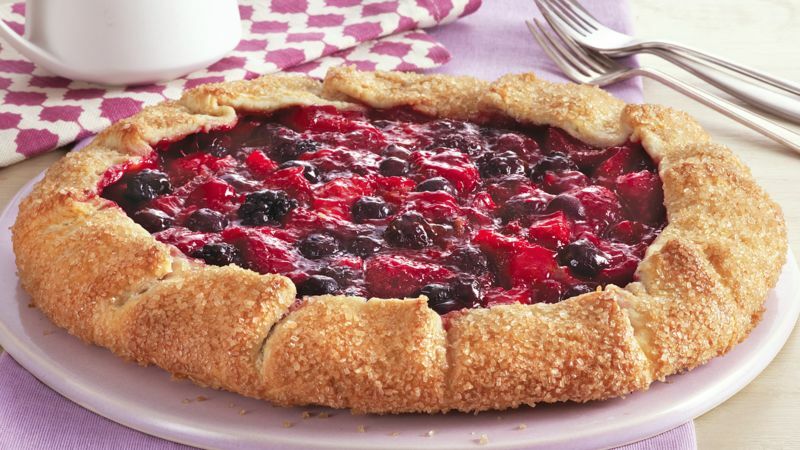 Pour berry-rhubarb mixture onto center of crust; spread mixture to within 1 1/2 inches of edge. Fold crust edge up over mixture, pleating crust as necessary. Using pastry brush, brush egg white over edge of crust. Sprinkle turbinado sugar generously over egg white. Bake 20 to 25 minutes or until edges of pie crust are golden brown, and center of pie crust is bubbly. Cool completely before serving, about 1 hour. Serve topped with ice cream. If you don't have a triple-berry mixture, frozen strawberries will do instead. For an easy, elegant dessert, try making this pie the night before and ready when you are!